TOKYO, Nov. 28, 2018 /PRNewswire/ -- Astellas Pharma Inc. (TSE: 4503, President and CEO: Kenji Yasukawa, Ph.D. "Astellas") today announced that the U.S. Food and Drug Administration (FDA) approved XOSPATA® (generic name: gilteritinib) for the treatment of adult patients who have relapsed or refractory (resistant to treatment) Acute Myeloid Leukemia (AML) with a FLT3 mutation as detected by an FDA-approved test.2 XOSPATA is an oral therapy and the first and only FLT3-targeting therapy to be approved by the FDA for this population. "Our ability to use precision medicine to help patients with FLT3-mutated AML takes an important step forward with the approval of XOSPATA," said Alexander Perl, M.D., Abramson Cancer Center, University of Pennsylvania. "There is an urgent need in the clinic for more targeted agents to help patients whose disease is either refractory to the initial therapy, or who have relapsed." "XOSPATA offers new hope to patients for whom the treatment path forward is unclear," said Steven Benner, M.D., senior vice president and global therapeutic area head, Oncology Development, Astellas. 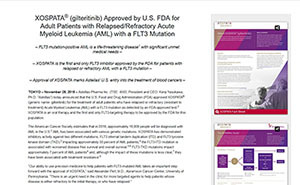 "For the first time, people with relapsed or refractory FLT3 mutation-positive AML have an FDA approved FLT3-targeting treatment available to them. The approval of XOSPATA is also a proud, landmark moment for our oncology program and marks the first approval of a medicine that will be the cornerstone of our new presence in blood cancers." The FDA's approval of XOSPATA was based on the interim analysis of the following endpoints in the ADMIRAL clinical trial: the rate of complete remission (CR)/complete remission with partial hematologic recovery (CRh); the duration of CR/CRh (DOR); and the rate of conversion from transfusion dependence to transfusion independence. The CR/CRh rate was 21%. The median duration of CR/CRh was 4.6 months. The rate of conversion from transfusion dependence to transfusion independence was 31.1% for any 56 day post-baseline period. For patients who achieved a CR/CRh, the median time to first response was 3.6 months (range, 0.9 to 9.6 months). The CR/CRh rate was 29 of 126 in patients with FLT3-ITD or FLT3-ITD/TKD and 0 of 12 in patients with FLT3-TKD only. The Phase 3 ADMIRAL trial (NCT02421939) was an open-label, multicenter, randomized study of gilteritinib versus salvage chemotherapy in adult patients with FLT3 mutations who are refractory to or have relapsed after first-line AML therapy. The primary endpoints of the trial are Overall Survival (OS) and complete remission/complete remission with partial hematologic recovery (CR/CRh) rates. The study enrolled 371 patients with FLT3 mutations present in bone marrow or whole blood, as determined by central lab. Subjects were randomized in a 2:1 ratio to receive gilteritinib (120 mg15) or salvage chemotherapy. Astellas Pharma Inc., based in Tokyo, Japan, is a company dedicated to improving the health of people around the world through the provision of innovative and reliable pharmaceutical products. For more information, please visit our website at www.astellas.com/us. 1 American Cancer Society. What is acute myeloid leukemia? (02-22-2016). https://www.cancer.org/cancer/acute-myeloid-leukemia/about/what-is-aml.html. Accessed 05-10-2018. 4 Patel JP, Gönen M, Figueroa ME, et al. Prognostic relevance of integrated genetic profiling in acute myeloid leukemia. N Engl J Med. 2012;366(12):1079-89. 5 Whitman SP, Archer KJ, Feng L, et al. Absence of the wild-type allele predicts poor prognosis in adult de novo acute myeloid leukemia with normal cytogenetics and the internal tandem duplication of FLT3: a Cancer and Leukemia Group B study. Cancer Res. 2001;61(19):7233-7239. 6 Whitman SP, Maharry K, Radmacher MD, et al. FLT3 internal tandem duplication associates with adverse outcome and gene- and microRNA-expression signatures in patients 60 years of age or older with primary cytogenetically normal acute myeloid leukemia: a Cancer and Leukemia Group B study. Blood. 2010;116(18):3622-3626. 7 Bacher U, Haferlach C, Kern W, Haferlach T, Schnittger S. Prognostic relevance of FLT3-TKD mutations in AML: the combination matters—an analysis of 3082 patients. Blood. 2008;111(5):2527-37. 8 Alvarado Y, Kantarjian H, Luthra R, et al. Treatment with FLT3 inhibitor in patients with FLT3-mutated acute myeloid leukemia is associated with development of secondary FLT3–tyrosine kinase domain mutations. Cancer. 2014;120(14):2142-9. 9 Astellas Pharma Inc. U.S. FDA Grants Orphan-Drug Designation to Astellas for Development of FLT3 Inhibitor Gilteritinib in Acute Myeloid Leukemia (07-20-2017). https://newsroom.astellas.us/2017-07-20-U-S-FDA-Grants-Orphan-Drug-Designation-to-Astellas-for-Development-of-FLT3-Inhibitor-Gilteritinib-in-Acute-Myeloid-Leukemia. Accessed 11-21-2018. 10 Astellas Pharma Inc. U.S. FDA Grants Priority Review to Astellas' New Drug Application for Gilteritinib for the Treatment of Adult Patients with Relapsed or Refractory Acute Myeloid Leukemia (AML) (05-29-2018). https://www.astellas.com/us/news/806. Accessed 11-21-2018. 11 Astellas Pharma Inc. Astellas Receives Orphan Designation from the European Commission for Gilteritinib for the Treatment of Acute Myeloid Leukaemia (07-23-2018). https://www.astellas.com/en/news/10211. Accessed 11-21-2018. 12 Astellas Pharma Inc. Astellas Receives Orphan Drug Designation from the Japanese MHLW for Gilteritinib (03-22-2018). https://www.astellas.com/en/news/10466. Accessed 11-21-2018. 13 Astellas Pharma Inc. Astellas Announces Approval in Japan for XOSPATA® 40 mg Tablets for the Treatment of FLT3mut+ Relapsed or Refractory AML (09-21-2018). https://www.astellas.com/us/news/14271. Accessed 11-21-2018. 14 ClinicalTrials.gov. A study of ASP2215 versus salvage chemotherapy in patients with relapsed refractory acute myeloid leukemia (AML) with FMS-like tyrosine kinase (FLT3) mutation (04-25-2018). https://clinicaltrials.gov/ct2/show/NCT02421939. Accessed 04-26-2018. 15 Gorcea CM, Burthem J, Tholouli E. ASP2215 in the treatment of relapsed/refractory acute myeloid leukemia with FLT3 mutation: background and design of the ADMIRAL trial. Future Oncol (Epub) 03-02-2018.